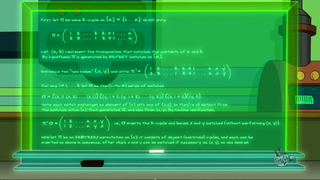 A writer for Futurama created a brand new math theorem based on group theory to explain a plot twist in the show. That is like, going way beyond the call of duty, dude. Ken Keeler, the Futurama writer behind the theorem, actually has a PhD in math, so this was probably just a walk in the park for him. But for the rest of us non math geniuses, his theorem was used to explain a problem with an invention that let characters switch bodies. In the show, you can only switch bodies once with the same pair of people, so they needed an equation to prove that with enough switching bodies around, everyone will eventually end up as who they really are. Insert: funny jokes, robot humor and black comedy and mix accordingly.